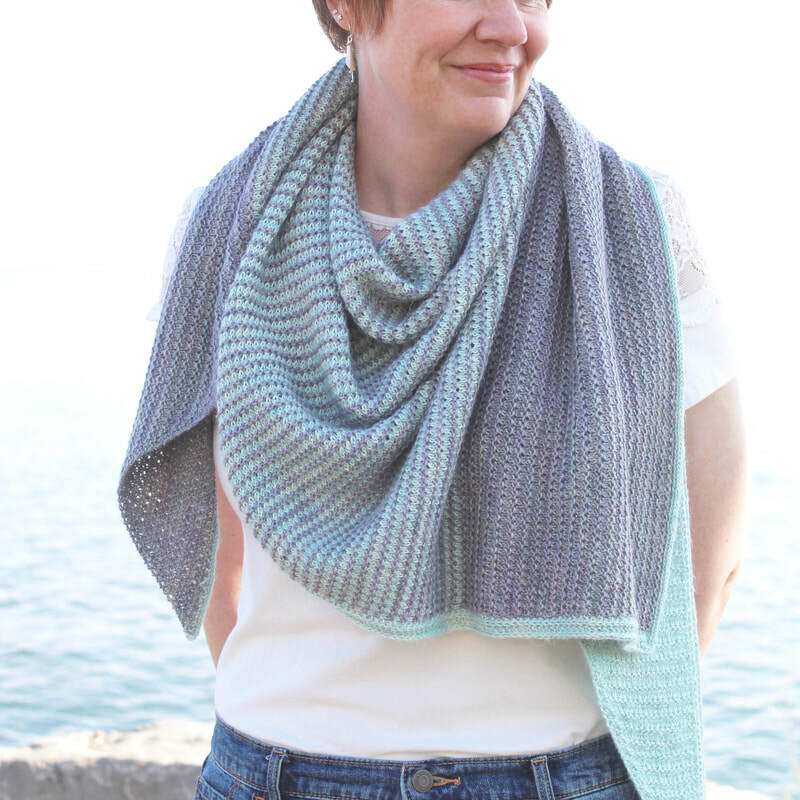 ​​Inspired by the colours of a churned up lake on a cold spring morning, and four gorgeous skeins of hand-dyed yarn! Despite its impressive size it’s super-squishy, so it remains comfortably portable from cast-on to bind-off. The pattern is easy to memorize, so most of the time you won’t even need to carry it with you. And, although a chart isn’t really necessary, I’ve included one so more 'visual' knitters can indulge! Thanks to a blend of alpaca, linen and silk, The Water Shawl has the perfect combination of lightness, summer-weight warmth, plus effortless drape and wrappability. The Water Shawl can easily accommodate more/less yarn, and less-than-perfect gauge. Guidelines for adjusting the size are given within the pattern. The Water Shawl is shaped like a right triangle, worked in three continuous sections from the bottom tip to the top edge. Section A is worked in C1. Section B alternates C1/C2. Section C is worked in C2. A modified I-Cord edging is maintained in C1 throughout, while a classic I-Cord bind off provides a thoughtfully balanced finish. 80” (200 cm) x 67” (170 cm) x 43” (110 cm), after light blocking. Yarn Indulgences Indulgent Love (50% Alpaca, 25% Silk, 25% Linen; 437 yards 400 meters / 100 grams): 2 skins in C2 “Mint Julep” and 2 skeins in C2 “Luster”. Note: “Brezo” by Americo Original would make an excellent substitution. Find it here. One 32” (80 cm) circular knitting needle size US 4 (3.5 mm). 30 stitches / 32 rows = 4” (10 cm) in Ridge Pattern, after blocking. **Exact gauge is not critical for this project, however variations in gauge will affect total yardage requirements.